The Environmental Protection Agency (EPA) recently announced Lancaster’s BLVD Transformation Project as the winner of the 2012 National Award for Smart Growth Achievement. The award was presented in Washington, D.C. to City officials earlier this month. 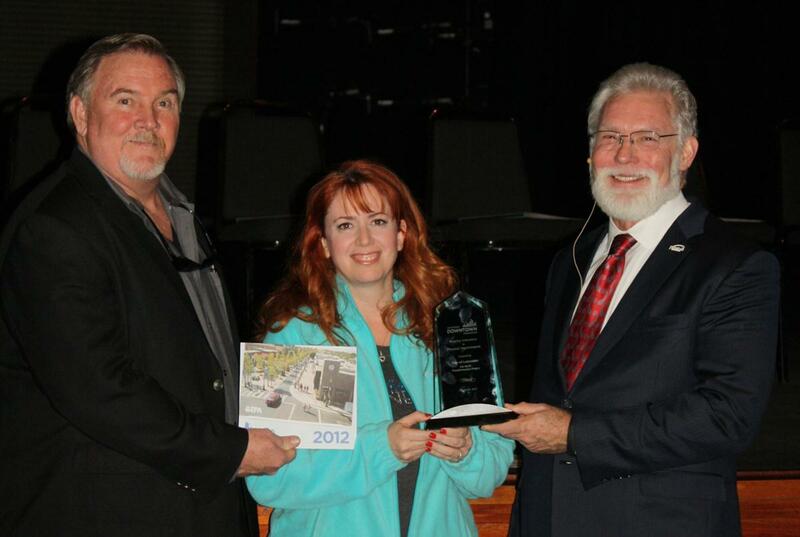 (L to R) Vice Mayor Marvin Crist, The BLVD Association Vice President Erica Allbee and Mayor R. Rex Parris. LANCASTER – The city of Lancaster’s effort to revitalize downtown Lancaster, dubbed “The BLVD Transformation Project,” has been awarded the 2012 National Award for Smart Growth Achievement from the Environmental Protection Agency (EPA). The BLVD was recognized for Overall Excellence, marking it as the top project nationwide for 2012. The California Downtown Association also recognized The BLVD with its Award of Excellence for Physical Improvement. The EPA’s National Award for Smart Growth Achievement recognizes exceptional approaches to development that protect the environment, encourage economic vitality, and enhance quality of life. The BLVD Transformation Project was selected to receive the award for Overall Excellence from among 47 applicants from 25 states. The winning entries were chosen based on their effectiveness in creating sustainable communities; fostering equitable development among public, private, and nonprofit stakeholders; and serving as national models for environmentally and economically sustainable development. “The 2012 winners of the National Award for Smart Growth Achievement are taking innovative steps to realize a vision of American communities that are clean, healthy, environmentally responsible, and economically resilient,” said EPA Administrator Lisa P. Jackson. The California Downtown Association (CDA) also recognized The BLVD Transformation Project with its Award of Excellence in the Physical Improvement category. The Association recognizes outstanding projects from throughout the State of California each year for excellence in Physical Improvement, Special Events and Promotions, and Planning. Lancaster previously won the 2010 award for Special Events and Promotions for the Streets of Lancaster Grand Prix. For more information on the National Award for Smart Growth Achievement, including a complete list of winners in other categories and videos featuring each winning project, visit www.epa.gov/smartgrowth/awards.htm. For a complete list of awards won for The BLVD, visit www.cityoflancasterca.org/blvdawards. 22 comments for "The BLVD garners national, statewide awards"
HUMMM! I JUST WONDER IF WE GOT AN AWARD FOR 2012 HAVING THE MOST CRIME AN SECTION 8 PEOPLE. NOT TO FORGET EBT PARTICIPANTS!! LOL GOOD JOB! Sometimes the best awards are the ones we give ourselves. Awards Ceremony, Friday at 7 at Kinetic Brewery. Do they give an award for wasting $90,000.00 a month?Do they give an award for wasting $90,000.00 a month?We have a winner!We have a winner!LEAPS wins!LEAPS wins!Wasting $90,000.00 a month.For what?Crime has gone up.Crime has gone up.LEAPS is a joke.LEAPS is a joke.We need more sherriffs.We need more sherriffs.We have great sherriffs.We need more sherriffs.We need more boots on the ground.No to LEAPS.No to LEAPS.Yes to more sherriffs.Yes to more sherriffs.More boots on the ground. oh Turd, you’re killin me! Kinetic Brewery is the BEST thing to happen to the BLVD! Great people, wonderful craft (and guest) taps, good food.. and more. I have gone in to do work on my laptop and then just hung out making new friends. How long before Parris determines too many potential customers are leaving his “investment establishment” and going to Kinetic… and he goes after them like the rest of his competition? I would have to agree the beers are great and you dont even have to add lime to the beer. Investment establishment? You mean Bex? Been there 4 times, they got the food order completely wrong all 4 times. Haven’t stepped foot in the place in over a year, won’t ever be going back. Biggest award for what… Largest financial sinkhole of tax dollars for a select few. Disgusting that someone at the city spends all their time just looking for these so called feel good awards to try and impress people with. The customer is always WRONG in your view. That kind of attitude helps make the BLVD a ‘no play zone’. But, keep it up if you must. There are lots of plants where parking spots should be, and these weird boxes. Everything on the BLVD is expensive can get the same crap at wallmart, the food is yucko crapo with bad customer service, I have gotten better service at mcdilldos. Yes, I have other *issues to take care of*. I’m disabled, you moron. Great Job Lancaster, it is good to hear some great news again! Glad to hear our city is doing great!